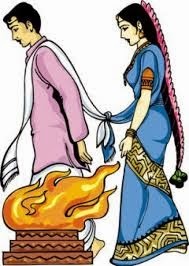 An Indian marriage is incomplete without this key stage - the sapta-padi: sapta means seven and pada means steps and saptapadi is the process. In this, the groom stands holding the bride's hand, and takes her seven steps, ideally towards the east or the north. The groom takes vows with the bride at each step. Even though a Hindu wedding is incomplete without the saptapadi, the exact process may differ from one culture to another. In some cultures it is done by making heaps of rice and taking one step on each heap; in others it is by drawing seven lines and the bride making a promise on each line; in some customs, the groom holds the right hand of the bride in his right hand, and holds the right foot toe with his left hand and helps take one step at a time. In some cultures it is said that it is not appropriate for the groom to hold the foot of the bride, therefore he should only hold her right hand and complete the saptapadi. So, it does not matter what process was followed but the intent is the same, the shanti mantras used are similar. The idea is to bind the husband and wife through mutually agreed upon promises. Unfortunately, very few people know what promises they make, so here is an attempt to present the same to those interested in knowing. Whether one uses rice or wheat or earth or whatever, the key is appreciate what each of these symbolizes. "On your first step, may VishNu follow you for giving unlimited food (material comforts). On your second step, may VishNu follow you for giving eminent health (strength, vigor, power, energy). On your third step, may VishNu follow you for helping you in your vratAs (conduct, meritorious acts, commitments, vows, resolves, wills, promises). On your fourth step, may VishNu follow you for giving you delight (pleasures, happiness). On your fifth step, may VishNu follow you for giving you good cows and other animals (livelihood). On your sixth step, may VishNu follow you for giving you beneficial seasons (and the ability to adjust to those). And on your seventh step, may VishNu follow you for giving you the benefits of the seven types of yajnAs (saptayajnAs), viz, hOtA, prashAstA, brAhmaNacChaMsi, pOtA, nEShTA, acChavaka, aagnidhra. May VishNu be with you in the stages of life"
Oh my friend, now is our marriage sealed. On the virtue of these seven steps we have become best friends. I vow not move out of your friendship, may you not move out my friendship. Let us resolve to perform our duties together, in cooperation, with love and affection. Let us take delight that our relationship was destined. May we be live together in harmony, may my mind be in you in all my deeds. If you are the lyrics (verse), I will be its meter (music). If you are the music, I will be the lyrics. If I am the space, you are the earth [earth and space go hand in hand]. If I am the seed (or the life source), and you are its beholder (the carrier). If I am the mind and you are the speech. I am the sAmavEda, you be the rigvEda. In this way be duly performing vows for the sake of begetting offspring and prosperity, oh dear friend come along with your sweet words. Saying this the groom takes the bride around the sacrificial fire for seeking the blessings from the deities (lAjAnAmAhutEH poorvaM sabrahmAgnau pradakshiNam). It is with this 'paaNigrahaNa samskaara', saptapadi, that the bride becomes eligible to be called a "dArA" (wife or "the owner or co-owner of the house"). With this the bride is said to have taken on a new gOtra (family name, race, lineage, clan, path, road). It is the saptapadi that confirms the relationship between husband and wife. It is only after the vows here that the two share the relationship. 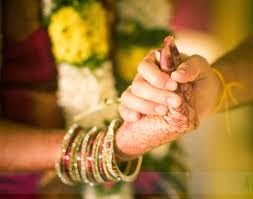 This is the process and importance of the extremely auspicious saptapadi process in the Indian marriage. This is one of the simplest and the most beautiful compositions in the magnanimous Kannada daasa saahitya. This one is dedicated to my friend who does not know Kannada but has experienced the song deep within his heart. Hey kailaasavAsa (the one residing in kailAsa), hey gaureesha (the Lord of Gauri), hey eesha (Lord), give me the mind (intellect, attitude, understanding, mood, desire) like the continuous free flowing stream of oil [where there is no friction; nothing can stop it] hey Shambhu (the all purifying one). In the deep darkness of the late night [in severe ignorance], I am wandering in this world as a leader of the lesser born [the immature ones] hey mahadEva (Lord of the dEvAs). Hey ahibhooshaNa (one decorated by snakes), without considering (disregarding) my deficiencies, please affix me, endow me, in the righteous path, and give me the devotion to Lord Vishnu, hEy Shambhu. This mind is not the cause for all the good and bad deeds (pApa and puNya) without your inspiration hey analAksha (one with the fiery eye, the all destroying). Oh the one who destroys the sinful inclinations and pride I fall at your feet like a stick, please submit this head at the foot of the lotus feet of the sajjana (good, righteous devotees) hey shambhu. Hey bhAgeerathidhara (the one who carries the all purifying mother Ganga on his head) please cure me of this fear, please protect me and nourish me continuously oh sarvadEva (the Lord of everything). Oh the one loved by the bhaagawatajana (devotees of the Lord), please endow me with the fortune to faultlessly engage in worship at the lotus feet of the Lord vijaya viTThala [Vijaya dAsA's iShTa dEvata or deity] hey shambhu. This is an offering on the day of "gurupurNima". It is a misfortune that the Indians are letting go of this system but those who are interested are probably more serious than ever before. People seek a "coach" for swimming or running or cricket but they forget to seek coach for the most important aspect of life - life or the soul. It is in this regard that I am putting together this document about what deeksha means. The word 'deeksha' or "diksha' has two parts, 'di' and 'ksha'. The letter 'di' indicates the 'dik' or the direction or the process of attaining the divine knowledge. The letter 'kSha' implies "cutting off" or "destroying" or the destruction of the accrued sins. Thus 'deekShA' implies two simultaneous processes - one that creates a new path of auspiciousness and knowledge, and the other destroys anything that which presents hurdles of any sort in the process. Alternatively, there is an "eeksha" in the deeksha, that which enables one to see or perceive that which is beyond one's ability otherwise. Because it awards (imparts, offers) divine knowledge and it completely destroys [the effects of] all the accrued sins, hence it is referred to as "deeksha" by the sages and the scholars of 'tantra' [authorities]. Because that offers divine (spiritual, heavenly, celestial, splendorous) experience in this very life (world), and completely destroys the impurities due to mAya, and because it grants the four factors of life (dharma, artha, kAma and mokSha), therefore it is said to be dheeksha. Life is an iceberg, what we see is less than 1/3 of what exist. This applies to our everything in our lives. The world that we see around is nothing but a spec of what is there beyond our senses. This applies to the relationship between our body and soul. The body that we are so familiar with is only the tip of an iceberg, the real stuff is deep within. Unlike the lower portions of the iceberg this inner stuff is invisible to the ordinary senses. It needs a "divya chakshu", a microscopic (or uber-ultra-nanoscopic) vision and deeksha provides that ability. "divya" is that which is beyond the sensory perceptions, and it is "guhyam". The greatest secret of life is the most fundamental of all - the "aatma", the basic element of existence. The 'aatma' since it is at the center is also called 'antaraatma', is invisible due to the darkness within. This 'darkness' is created by the layers of maaya that cover the intellect. deeksha then is the process the lights the lamp within and makes the "aatman" within visible, and the relationship between aatma and paramaatma possible. This relationship is beautifully explained in the below verses. The illusion or ignorance created by maya is likened to the darkness within a pot, the knowledge to the lamp and the process to deeksha. So, in essence, self-realization or mOksha is not possible without deeksha, the process where the guru helps light the lamp within. You cannot see Me with your present eyes. I therefor give to you the divine eyes by which you can behold My mystic opulence. In essence, Sri Krishna is giving the deeksha to Arjuna. All the japAs are rooted in the deeksha [deeksha is the source or origin or the base of all japas], all the austerities are rooted in deeksha. One should take the shelter of deeksha in whichever ashram one lives in. There are particular warnings about learning by self via cassettes or CDs or books or internet. One is warned against learning a sport or music via books on his/her own because they may pickup wrong skills which may be difficult to correct later on. This is even more critical when it comes to adhyamta vidya. Unlike the material vidyAs (avidyAs) the spiritual vidya has subtler impacts because they operate at a much subtler level. It is also said that the deities to who the mantras or the tapas or the japas are directed to, are easier to obtain via the process of initiation. The logic is, the guru already has access to the higher platforms. He already has the bridge. It is said that the deities reject offerings from those who are not initiated. This is more to warn the experimenters that to discourage practice. Just like the hardwork which is not well directed is wasted, the efforts of an uninitiated is said to become fruitless. Not only do the deities accept the archanams of an adeekshita, but an adeekshita is compared to an animal. The efforts of an adeekshita is compared to the process of sowing a seed in stone, which required enormous efforts but the fruits are minimal or none. Whatever the adhiksitas perform - whether pooja or japa or other kriyAs, they will not yield results (fruits), such efforts are like sowing a seed in a stone. A sinner who exists on earth without dIkShA from Sadguru remains delusional and suffers in hell after death. As dIkShA is the gateway to Atma jnana, without it, there is no means for liberation for a jIva. Therefore, the one who exists without the deeksha remains sinful, engaged in wrong doings, stuck in the deep darkness of existence, and falls down to the hellish lives. laukika deeksha is the mundane material deeksha. This may involve deeksha into education or music or sports or finance or political or other aspects of managing and excelling one's material pursuits. One should not obtain deeksha from one's father, maternal grandfather, younger brother, or one who has sought refugee under the enemy. It is said that it deekShA from a brahmachAri is good, from a grahasta or a vAnaprastha is better, and from a sanyAsi is even better. However, it is best to take deeksha from a ativarNashrami or an avadhoota. Having chosen one's Guru after careful examination, if one gives up Swaguru or the iShTa mantra, such an aspirant welcomes poverty and untimely death. After death, he attains the hell called raurava. However, if one realizes that his Guru is unqualified, sinner or incapable of imparting the desired knowledge, such a Guru can be discarded. However. Very careful consideration is necessary here as the disciple would need to have the required maturity to judge the Guru. YajnOpavita has several names but this is the most authentic Sanskrit name to it, and it clears states itself - the sacred thread to perform the vedic rituals to please Lord VishNu - the yajna or yajamAna. "Once the devataas (gods) and the asuraas (demons) were fighting over who has the first right to the heavens. Each wanted to be the privilege, and pursued the yajna. The asuraas through their physical strengths very quickly accumulated all the resources needed for the yajna and started off. In their rush they did not follow the process prescribed in the vedas. However, the devas followed all the rules of brahmacharya and vedas. The asuras not knowing what is to be done and what is not to be, did not attain the heavens. The devas attained the heavenly planets by being diligent and sincerity. Because of their virtues the devas defeated the asuraas. It was the yajnopaveeta that the devas wore that served them, saved them, and yielded the positive results. Alas, the rites performed by the asuras lacking the yajnopavita did not yield any results. Therefore one should perform all rites upon wearing the yajnopaveeta"
yajnopaveeta: When one wears the sacred thread from the top of the left shoulder down to below the right shoulders then it is called yajnopaveeta. Vedas prescribe that when performing different karmaas one should wear the sacred thread in different ways, to indicate symbolically. When performing manuShyakaarya one should wear like the niveeta, during the pitrkaarya the praacheenaveeta, and during the dEvakaarya one should wear the upaveeta. Once Lord Brahma, the creator, manifested the three modes of material nature (satva, rajo, tamo) into three threads. He then manifested Himself into the three phases of life (shriti, sthithi, laya) into brahma, vishNu and maheshvara, and multiplied these together into nine threadlings. Since this was conceived by Lord Brahma, this has since been known as brahmasootra. Lord Brahma himself was the first to wear this. So, the yajnopaveeta symbolizes and represents the above aspects of existence. The deities exist symbolically in the yajnopaveeta, i.e. everything is within reach for someone who puts on the yajnopaveeta with sincerity and dedication. As the popular saying goes "dharmo rakshati rakshitaH", i.e. it will protect those who protect it. The two ends of the ShaNvati are tied together, and if the two ends appear at the end it is supposedly called the "brahmagranthi" and if the two ends are put inside the knot then it is called to be "rudragranti". It is a common practice that the vaishNavaAs wear a brahmagranthi and the shaivaas wear a rudragranthi. The Tamilians usually call the yajnopaveeta as poonal, where "poo" means that which is sacred or pure or pavitra. "nool" means the gamut of vedic scriptures. "poonool" or "pooNal" then represents the sacred vedic scriptures. Alternatively, "nool" also means thread, as such it is the sacred thread. There is a vedic process behind how the multilayered threads are created via the chanting of the vedic mantrAs. There is a special way that the individual threads are brought together by tying the brahma or rudra granthi. Wearing this provides one the basic qualification of studying and understanding the srutis and smritis. That which enables one to comprehend the Lord and the scriptures which describe him, and that which takes or carries one closer to the shaastraas is called yajnOpaveeta. In Kannada it is often referred to as "janivAra", which is infact a Sanskrit word. Because of it purifying nature, the yajnOpaveeta has the potency to enable one to transcend the platform of janma and mrutyu. It has the potency to free the chetana from aagaami, sanchita and praarabdha karmAs, and to liberate the soul from this material world. Because of its ability to free the individual from rebirth it is said "जनि-प्रादुर्भावं वारयति निवारयति इति जनिवारः". A brahmachaari, along with the ajina wears one set of the yajnOpaveeta, the gRuhastha and vAnaprastha wear two upaveetAs, and the sanyAsi wears only one. Sage Devala says that a gRuhastha can wear three upaveetaas, that people from all the four ashramas should wear the yajnOpaveeta, and if one takes it away then he will have to perform austerities and the upanayana should be done again. If one stays without the yajnOpaveeta for a day then he will be relegated to the status of a shudra, and is said to have seen death (because one loses the birth he took by wearing it). Therefore all the four aashramAs should wear the yajnOpaveeta at all times. If one loses the yajnOpaveeta by accident (while removing a shirt or in a river etc), then he should wear one at the earliest, or atleast wear a cotton thread in place, and find the yajnOpaveeta as soon as possible. Om! this yajnOpaveeta is the best among those that purity, that which is extremely sacred, that which was born along with Lord Brahma in the beginning; that which increases one's life and prominence, that which is sacred and clean, and confers both strengths and charm to the one who wears it. There were discussions today about the significance of the different threads in the "janivaara" or the "poonal" or the "yajnopavita". Before trying to understand the significance of the layers we need to appreciate and understand the meaning and significance of janivaara. To understand the significance of janivaara it is important to understand that of upanayana. Upanayana is a "samskaara" (the cleansing, sacramental, training, refining) process to enable the learning for a child. 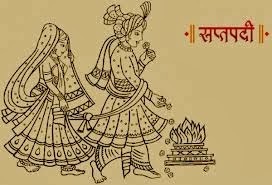 Over a period of time it has been limited to the boychild and the girl child's upanayana supposedly happened during the marriage. Upanayana, as defined by sage Bharadhwaja is "उपनयाख्यं यत्कर्म विद्यार्थं तदुदीरितम्", "उपसमीपे आचार्यादीनां वटॊः नीतिः नयनं प्रपणं उपनयनं", i.e. The process of sending the student to the proximity of a great practitioner, a guru, is called upanayanam. Or, "आचार्यादीनं समीपे वटुः नीयते येन संस्कारॆण कर्मण तत् संस्कारकर्म उपनयनम्", that samskaara that takes the student closer to an aachaarya is said to be upanayana. The aachaarya instructs the pupil on a variety of subjects but the initiation happens via the gayatri manta, the essence of all the vedic injunctions. Sage Katyayana says "गायत्र्या ब्राह्मणं उपनयीत | उपनयनं विद्यार्थस्य शृतितः संस्कारः". i.e. Upanayanam is a samskaara that is done via the sacred texts of the vedas. There, the binding of the maunji (a brahmanical girdle formed of munja grass) marks the spiritual birth (brahmajanma), where it is said that his mother will be mother sAvitri and father the aachaaraya. Such a beautiful way to describe the "rebirth" of the student, where knowledge is said to create that new individual; where "ray of light" (gayatri, a verse in praise of savitru devata) becomes the cause of all learning and the aacharya seeds this in the student, thus becoming the father. The aachaarya certainly gives birth via the knowledge, through education, this is the superior birth, not the bodily birth given by the parents. This is not to discount the role of parent but to highlight the greatness of knowledge and education. 3) prajnA - ability to connect the learning to practice; to view the past, the present and the future in a logical, reasoned, rational way. So the whole reason for this samskaara is to enable an individual to be educated, to learn, and to mature. It is the initiation for the student to contribute positively to the society in the end. There is a second reason why this samskaara is important. This samskaaraa can cleanse some of the "dOshAs" of the previous janma - the current bodily birth and also that of the previous birth, by the grace of all the deities that are invited, worshiped and sought blessings from. This process is ideally done at the age 7, because that is a critical age for learning and connecting dots. This samskaara is prescribed for all varNas even though the curricula may vary. There is a beautiful sanskrit saying: "सा विद्या या विमुक्तयॆ", that is education which is liberating. Manu warns that if this samskaara is not done on time then the critical learning time will have past. Once the appropriate time is past, the opportunity is lost, the student will not be able to grasp gayatri. They will be called vraatya or out-castes, so people of all the three varNas should perform this samskaara on time. For the attainment of brahma-varchas a 'brahmaNa' should perform upakarma when the child is 5 year old. For the attainment of strength, a 'kshatriya' should perform when the child is 6. And, for the attainment of wealth and business a 'vaishya' should perform it when the child is 8. In essence, early education is the key. One should pray and desire for the performer (the guru, who leads the samskaara) has the following attributes: complete conviction of the vedic injunctions (that he is competent), is rightful and knows the dharma well, has a good background (endowed with good samskaara himself), is well learned in the vedas (modest, conversant with sacred scriptures), pure ('clean character'), is knowledgeable of his vedic branch, is not lazy (is energetic), and is a strong theologian. I will not get into discussion about when, at what specific time of the year, and how this samskaara should be performed. That is the ritualistic side, which can change from one custom to another. In the next part I will try to discuss the specific details or the significance of janivaara and so on. "Time" is one of the several fascinating things in the Indian system. For most people India's contribution is limited to the "number system" and the "yOGa" (in its current distorted, western form), however there is so much more than India has to offer than just these. The greatest wealth that remain hugely unexplored from the Indian texts include Spirituality (or the consciousness studies), Science, Philosophy, and Mathematics. For the western eyes, the obsession with Tolstoy or Weber or Aristotle or Plato or Descartes or Epicurus or Locke has blinded them to the great works elsewhere. It has sometimes been deliberate and at others due to ignorance. They have explored Confucius to some extent but have largely ignored the Indian contribution. This appears like a deliberate attempt - at suppressing some of the most brilliant ideas ever. Even when the world was discussing about a flat earth, which was 5000 year old, Indian greats had presented a much more comprehensive picture of the time and origin of this universe. When the world was discussing the connection of body and mind, the Indian texts had gone beyond and explored the spiritual connection. Of the many things, I explore the concept of time in an extremely brief way in this post. For an Indian seer, time was beginning-less because they could fathom the idea of infinity and eternity. However, here is how the time has been perceived (as described in Bhagawata and other scriptures). 1) World (and thus the relative 'time') is created and destroyed time and again after a period of time, in a cyclic manner. That period is determined by the life span of Brahma. There are several "brahmA"s and thus several Universes. So, the life span of the current Universe is approximately 309 Trillion 173 Billion 760 Millions human years, out of which we have already spent a little more than 50 years, which is a little less than 154, 586, 880, 000, 000 years. So, we have a little more than 154, 586, 880, 000, 000 years remaining before the complete dissolution of this current creation. At this time even Brahma is recycled. Please note that the above numbers pertain just to the current cycle of creation and such cycles have happened infinitely in the past. The current scientific estimate of the life of our planet is around 4.54 billion years, and this is just a fraction of the whole creation. There are near infinite universes in the current creation and that itself is but a small fraction of the entire span. This is described as "pAdosya vishvA bhootAni | tripAdasyAmritam divi", i.e. this entire creation is merely a fraction and 2/3rd are in the spiritual realm, and beyond that is the Lord, who looms above all creation. I don't understand why they write songs that ask Shiva to give us bhakti on Vishnu. Why does the poet want Bhakti from Shiva and worship Vishnu? why doesn't he directly ask Vishnu? To understand why they write songs that ask Shiva to give Bhakti on VishNu, we need to understand their notion of Shiva and VishNu. Please also note that their description may not match with our description. Expecting that would not be appropriate! Will it be? The first step to a more complex answer is to understand that we have differences in how we understand, that does not make us right and them wrong or them right and us wrong. It is a difference in perspective, interpretation and inference. Their perspective of the key elements of spirituality is different from that of ours, wrt jiva (aatma), bhagavanta (paramaatma), lOka, tattva, karma and mOksha. Similarly, their key scriptures and their interpretations are different. As you may know, there are three levels of authentication - saadhu, shaastra and guru and we differ at all these levels. We may have common shaastraas but how they are interpreted are different. Would it make sense to compare our understanding with theirs when we differ at the fundamental level? Second level: for a tatvavaadin jeevaatma and paramaatma are not the same, unlike they are for a advaitin. Jeevaatma is subject to karma, maaya, rebirth on which he does not have complete control over. But the paramaatma is above jeevaatma, and He is beyond karma, maaya, rebirth and has absolute control. He is above and beyond the material creation unlike a jeevaatma who is subdued by it. The references to this can be found in several shaastraas and specifically Bhagawad Gita. So, how they view jeeva, devatas, devas, brahma, vishNu and shiva are different from from an advaiti's perspective. Lord Shiva said: My dear Lord, my mind and consciousness are always fixed on Your lotus feet, which, as the source of all benediction and the fulfillment of all desires, are worshiped by all liberated great sages because Your lotus feet are worthy of worship. With my mind fixed on Your lotus feet, I am no longer disturbed by persons who blaspheme me, claiming that my activities are not purified. I do not mind their accusations, and I excuse them out of compassion, just as You exhibit compassion toward all living entities. So, since they are Bhagawata priyAs they follow Srimad Bhagawatam, but what are we following? They also find support from other scriptures such as the svetashvatara and other upanishads. Similar references can be found in other vaishNava shAstrAs that they refer to. Fourth Level: We seek the blessings of the purest souls in our spiritual pursuits, for example the greatest devotees and guru. For them Lord Shiva is a great soul - the greatest in the world, the top most among all gods. As said before, He is the greatest vaiShNava, the greatest devotee of VishNu (from their perspective and they have their right to view so). Just like we say "guruvina gulAmanaaguva tanaka doreyadaNNa mukuti", one cannot aspire for liberation, i.e. unalloyed bhakti for Lord VishNu, without the blessings of Lord Shiva and this is supported in the shaastraas they refer to. So much more can be said, but I will stop here. Objections to Sri Vijaya Dasa's "manasu kaaraNavalla .."
1) Is worship of one Lord a bias?, is not "ekam sat" the universal truth? Whether one calls it VishNu or Shiva or aatma or whatever, how does it matter for an advaita? 2) If we believe that VishNu, Shiva, and Brahma are one and the same, how does it matter if one chooses to worship one over the other, or focuses on only one aspect? Are they not simultaneously worshiping the others whether want or not? so, where is the objection? Objection seems more from a material perspective. 3) For an advaiti, where is the difference between vishnu or brahma or shiva or self or this world, so why should this objection at all? 4) In sandhyavandanam, do we not start and end with "keshavaaya swaha, narayaNaya swaaha, maadhavaaya swaaha, govindaaya namah vishNave namaH ..... sri krishNaaya namah" and "kaayena vaacha .... naaraayaNa-arpaNamastu". Who's name are we chanting? Do we not end everything with "krishNarpaNamastu"? Do we not say "aakaashaat patitam toyaM yathA gacchati saagaram sarva dEva namaskaaraH keshavam prati gacchati"? Does that not imply something? If they choose to worship one VishNu, what is the problem? If they seek the blessings of Lord Shiva to increase their bhakti for VishNu, what is the problem? Where is the bias? If this is bias, are we not biased in that case? are we not prejudiced? are we free from the bias and prejudice? Why blame them? Is it possible that we are wrong? We believe that we are right and thus see them wrong, but for a advaiti there is no meaning to the duality of right and wrong. Why cannot we accept the fact that what we have are perspectives, and why accuse one party of having a perspective? 5) What is wrong in asking Shambhu for Bhakti for VishNu, when Shambhu and VishNu are non-different for us? How does it matter? For them, they both could be different and that is not without logic, they have their own reason that we may disagree with but that does not make them wrong and us right! And, Sri Madhvacharya was not a simpleton. Advaitic perspective to "manasu kaaraNavalla"
This is in response to a recent discussion on a topic (started by Sriharsha Aswathanarayan) on the smaartha brahmin group on Facebook. "manasu kaaraNavalla paapa puNyakkella, analaaksha ninna preraNeyillade"
The question was "how do we interpret this from Advaitha perspective?" "I am not sure why this needs to be interpreted in Advaithic perspective at all! It is written by a "dvaiti" great, a Madhva anuyaayi, Sri Vijaya Daasaru. Why cannot we appreciate both? Not everything needs to be interpreted philosophically; however, there is a philosophy in this too. I feel it needs to be relished the way it is." However, the discussion went on and I thought of putting things together in a blog. First of all, the line is taken out of context, as such I consider the discussion itself meaningless, but the discussion has pursued for lengths. I am writing this blog to clarify a few things, from my perspective. The above line is taken from a popular and beautiful song of Sri Vijayavitthala Daasa, where he seeks the blessings of Lord Shiva to bestow on him the "bhakti" for Lord Hari. Why Lord Shiva? Because, Lord Shiva is known to remove the poison in one's mind and bestow auspiciousness. It is in this perspective that He is being prayed for - to create the pure mind. If we see here, the poet is writing about how he feels lost in this world; roaming endlessly. So he is seeking the mercy of Lord Shiva to pursue his goal - i.e. to attain Vishnu or Hari. He seems tormented and realized by personal experience that without the mercy of Lord Shiva it is difficult for him the association of virtuous people or other devotees. Is it an aberration to seek such blessings for the pursuit of a supreme goal? I will later discuss why the poet says that "mind is not the cause of paapa and puNya without your sanction"
Here, Sri Shankara submits himself to Shankara BhagavatpAda, similar to how Sri Vijaya Dasa submits. Sri Shankara and all aachaaryaas seek the blessings of the guru and God to pursue spiritual goals. How do we understand such prayers from Advaitic context? It is a practice to take the blessings of a guru, a greater 'devotee' or a greater personality or a greater deity or divinity to pursue personal goals. Two friends make similar objections: "paapa punya are purely actions and not athma, athma or brahmha is not responsible for these actions if i am right" and "as per advaitha, paapa and punya are actions of mind and not the athma or brahma". "Advaitins believe that mind is responsible for everything. The paapa punya is for the body that arises by actions which is a consequence of thoughts (vasanas). So, from advaitic point of view, mind is responsible"
Before addressing this objection, it is important to go back to the original line. "manasu kAraNavalla paapa puNyakkella, analAksha ninna preraNe illade". 2) "analAksha ninna preraNe illade"
We cannot and should not discuss the first line alone without the second. Do we not agree with the statement "tena vina triNamapi na chalati? ", does that not apply to the mind also? Is not the Lord sitting within. Does not the Lord say "sarvasya chAham hridi sanniviShTo mattah smritir jnAnam apohanam cha", i.e. "I am the Lord of everything and from me comes remembrance, knowledge and forgetfulness"? So, does that not imply that even though we are in control, actions are "sanctioned" by Him? Reading Gita will provide a great perspective to this. So, there is mind and there is action, but then there is a discussion of the Lord within everyone, who sanctions all actions - not that he is a dictator but as a witness. b) There are many contradiction ins the above claims made by my friends. Here is why: as per advaitha, how can there be a difference between mind, aathma and brahma? are they not reflections of the same thing? are not paapa and puNya in duality, and where is duality in advaitha? c) First of all what is aatma? Second, without aatma or brahman where is the mind? who takes rebirth, just the mind? who is stuck in the material world and why? what is the role of aatma then? can mind be independent of aatma? If aatma and paramaatma are the same then where is puNya and paapa for paramaatma? where is karma for paramaatma? Sri Krishna says "aatmaiva aatmano bandhuH aatmaiva ripuh aatmanah", which aatma are we talking about here? So, even though "manasu kaaraNa paapa puNyakke" appears true, it would inappropriate to say "manassu maatra kaaraNa paapa puNyakke". That would be a misplaced statement; i.e. it is wrong to say that "mind alone is responsible", mind is just a via media, because Manasu is dependent on a number of factors and what Sri Vijaya Daasa does is to purify it by submitting it to Lord Shiva. Sri Shankara says that the are things that are beyond mind and speech Pratarbhajámi manasám vacasámagamyam. No one can say that the mind is entirely in one's control and different people find different tools and approaches to mind control. So, manasu cannot be the lone contributor to paapa and puNya, and manasu is not entirely in our control, so there must be a sanctioning agent! right? Objection 2) Why did vijay daasaru, a madhva by tradition tell these lines? I will address just this question. So, Shambhu is an important figure. Lord Shiva, the spiritual master of the entire world, is free from enmity, is a peaceful personality, and is always satisfied in himself. He is the greatest among the demigods. How is it possible that Daksha could be inimical towards such an auspicious personality? Similarly, the other verses that follow after these in Bhagawatam also reflect the oneness of Brahma, VishNu and Shiva. These are just cursory references that I remember. I also know that VaishNava aachaaryaas go lengths to describe why Shiva is to be worshiped (I am unable to quote verses but I have read it from authentic sources). Learned VaishNavAs and aachaaryaas even claim that if one does not worship or respect Lord Shiva then he cannot be a good vaishNava and would be committing a great aparaadha. If some do not follow, let us not blame the system. So, we cannot compare some mean minded dwaitis to the great works of great vaishNavaas. How can we disregard the greatness of Purandara daasa and Kanakadaasa and tag them as biased. They are "focused" and their perspective was different, why disrepesct for difference of opinion, practice and perspective? There are several other objections, questions and challenges that I will address separately in separate posts.